Offers:Up to US $420 off selected dates. It will be hot and humid, especially in the jungle. Physical preparation is a good idea as is bringing insect repellent, waterproof bags and a head scarf. Small group. Max 12. Min age 15. 2 nights cabin, 2 nights dorm, 1 night homestay (all shared facilities), 4 nights hotel. Accomm, transport, activities and group leader throughout. 8 breks, 2 lunches, 2 dinners. Individuals welcome. Single hotel rooms (only) at a surcharge. In 1988, two Aussies set off for Africa in a modified truck - and realised it was something others might enjoy too. The resulting company has a fun, affordable and responsible ethos with tours in over 110 countries. As a global operator, we take our role in the tourism industry very seriously. We recognise the impact that tourism has on local communities and the environment and we plan and operate all our tours with this front of our minds. We believe that every tour operator must be responsible in the way they conduct their business, to ensure the welfare of all people and the conservation of the environment. We are committed to operating in a responsible manner, incorporating the principles of sustainable development in the way we provide our travelers with real life experiences. We believe that responsible travel is about the attitude you take with you and the choices you make when traveling - to respect and benefit local people, their cultures, economy and the environment. On this trip to Borneo travelers will encounter local communities along the riverbanks and stay overnight with our Iban hosts. The benefits of this are obvious for both parties; as well as the financial benefit to the local community, this gives us as travelers a privileged insight into a culture and lifestyle very different from our own. As part of our commitment to traveling without impact, we recommend that our travelers come prepared for this experience and are aware that dress standards are conservative in many rural areas. We recommend loose, lightweight clothing so as not to offend, particularly in areas outside of the major cities, where much of this trip is spent. One of the many advantages of traveling in small groups is the flexibility it gives us getting from A to B. We take care to use local transport on this trip, utilising local boats along the coast and waterways of Sarawak and preferring to explore the jungle trails and pathways on foot to make the most of wildlife spotting opportunities. Walking and trekking obviously being the most eco-friendly of transport methods, providing the only thing left behind is footprints! As a further part of our commitment to responsible travel this trips stays in a combination of small, locally owned hotels, and more basic, dormitory accommodations in Mulu and Bako National Parks. As mentioned above we also have a night in a traditional Iban Longhouse. We source produce locally throughout the trip, eat at local restaurants and encourage our travelers to purchase souvenirs from local artisans and recruit our on the ground team, including group leader from the local community. These small factors not allow us a fantastic insight into the country and a snap shot of day to day life, but it also puts valuable financial resources back into the local economy, creating jobs and supporting local businesses. Visits to projects such as the Semenggoh Orangutan Sanctuary and our entrance fees into the National Parks also assist in financially supporting vital conservation projects and preserving the environment for future generations. It was great. I really enjoyed it. We had an amazing guide and we were only a group of 3. Don't know how much different it would be with a bigger group. Definitely climbing Mount Kinabalu. But very closely followed by the wildlife from orangutans, wild elephants to the sea turtles. Be prepared for the climb. Do some exercise to get your legs ready for constant up hill (doesn't need to be too extreme just enough to be prepared). The infrastructure and facilities are a lot more westernised than i was expecting, don't go too overboard on packing lots of thing you don't think you can buy... you probably can. Including hats and gloves for the mountain! The information and advice we were given about local communities, cultures, and ways of life was spot on. I knew how to dress appropriately, how we were benefiting those we were meeting and never felt like we were imposing on others. Everyone greeted us warmly and were so pleased to be our hosts. Excellent. A whirlwind tour of Sabah, so never felt too rushed. Plenty of time to take things in and relax but still squeezing in a lot to 2 weeks. Some accommodation was very basic, so be ready for that but in the main it was clean, safe and comfortable. Our tour leader, Stacey, was great. Patient with us all when trying to gather 12 very different people together and always smiling. Having someone who spoke Malay and knew the people we were staying with made it feel very welcoming and organised. You should definitely book on this trip! 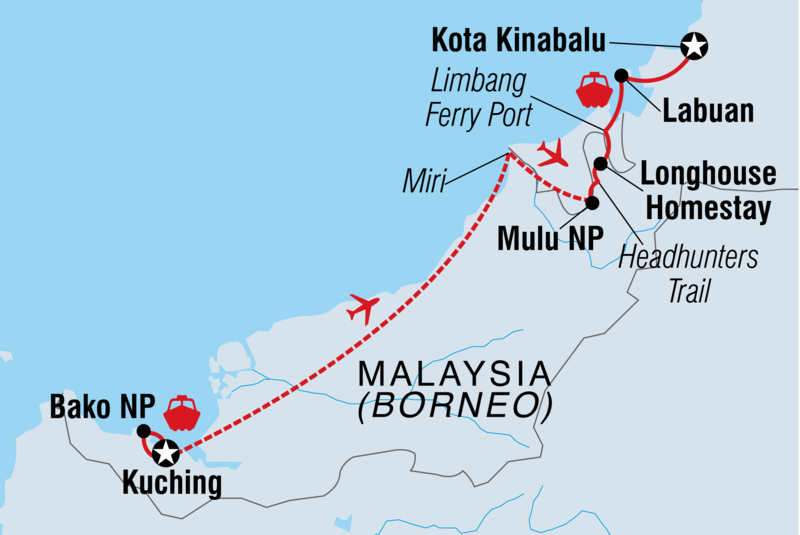 The various methods of travel through Borneo really gave you a sense of traveling like locals and getting the maximum "real life" experience. Take an open mind and enjoy every moment. The best travel experience I have had so far!